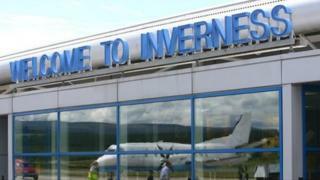 Thèid leudachadh a dhèanamh air Port-adhair Inbhir Nis, air chosgais £900,000. Thèid an seòmar suidhe airson luchd-siubhail a tha a' sgeith a-mach à Inbhir Nis cha mhòr a dhùblachadh, agus thèid àite ùr a thogail airson luchd-siubhail a thig far sheirbheisean eadar-nàiseanta. Tha barrachd sheirbheisean ann eadar Inbhir Nis agus bailtean Eòrpach agus tha Puirt-adhair na Gàidhealtachd 's nan Eilean airson tuilleadh fàis a bhrosnachadh. Bha an àireamh luchd-siubhail a chaidh tro Phort-adhair Inbhir Nis an-uiridh aig an ìre a b' àirde bho chionn sia bliadhna. B' e seirbheisean eadar-nàiseanta a chur ris an àrdachadh sin - le seirbheisean a' ceangal Inbhir Nis ri Amsterdam, Baile Átha Cliath, Zurich agus Geneva. Tòisichidh a' chompanaidh Dhuitseach KLM seirbheis ùr eadar Inbhir Nis agus Schiphol sa Chèitean, agus cuiridh British Airways seirbheis ùr làitheil air dòigh eadar Inbhir Nis agus Heathrow - cha mhòr fichead bliadhna às dèidh dhan tè mu dheireadh stad. Thuirt manaidsear Phuirt-adhair Inbhir Nis, Graeme Bell, gu bheil leudachadh a dhìth 's dòchas aca gur e seo a' bhliadhna as trainge riamh a bhios aig a' phort-adhair.